Yes, this is without question my absolute FAVORITE cooking show. When Stephen asked for iTunes reviews in the most recent episode, I was all too willing to comply. If you like anything having to do with food and the adventure of preparing it and you aren't subscribed to this podcast, you are really missing out. The selection of prepared dishes is always diverse, usually taking the listener on a culinary tour around the globe, and we are involved in every bit of the process, from wandering around the grocery store to silly dinner conversations. The big sell is that Stacey and Stephen are such interesting, eloquent and witty characters, they never fail to throw in a clever joke or observation that'll award you the hairy eyeball from everyone in your office or gym or wherever you listen... They never fail to deliver on the "hapless," either! It's especially a must-listen for any klutzy cook, like myself. If there's one bad thing I have to say about it, it's that it only comes out once a month! For the quality of each show, though, I really can't be that upset about it. 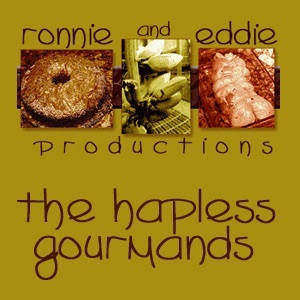 When a new episode of 'The Hapless Gourmands' is released, it's immediately at the top of my listening list. The food sounds pretty good (once in a while I even learn something!) and the incidental music is spot-on, but the hosts and their guests are the reason to listen. They're witty, spontaneous and can tell a great story. The retelling of the stone soup fairy tale in the Rockettes episode made me laugh so hard that people in the gym have started avoiding me.